We’re excited to be Virtually Connecting from Australasian Society for Computers in Learning in Tertiary Education, ASCILITE conference for 2017. Thanks to the Hazel Jones and the ASCILITE organising committee for supporting this connection. Monday December 4, 12 noon AEST. 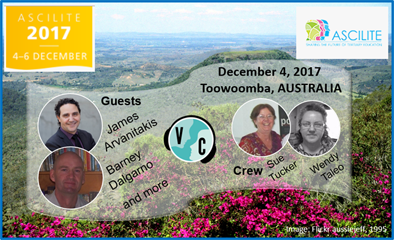 Onsite guests James Arvanitakis (@jarvanitakis) and Barney Dalgarno (@bdalgarno) will be joined by Sue Tucker as our onsite buddy (@sueinasp). Wendy Taleo (@wentale) will be the virtual buddy and host for this session. For background reading there is a ‘few things’ about James Arvanitakis and Barney Dalgarno’s website. Join us in chatting to some of the folks onsite. Tweet us @vconnecting or leave a comment below. We’ll ask for your email address so we can send you a link to the session just before it goes live. Title times are local to the conference site, scroll below to find the session time adjusted to your timezones and the link to watch the session live or recorded if you can’t make it into the session itself. Active session participation: be a participant in the session and talk to the guests and other participants. To do so, you need to register by tweeting us @vconnecting or leaving a comment below. One of us will contact you to get your email address, and then you will get a confirmation email a day or so before the event, and a link to participate in the Google hangout around half an hour before the event. All you need in order to do this is to have working audio on your computer (update your hangouts plugin) or phone/tablet (update your Hangouts app). Watch and tweet: watch the session live (see the embedded videos above or go to our YouTube channel www.youtube.com/virtuallyconnecting). If you choose to Tweet along, please tag @vconnecting and add the conference hashtag #ASCILITE17. One of our buddies is likely to pick up on your questions on Twitter and relay them to the participants in the live session. Watch the recording: watch the session recorded (again, same embedded videos above, or our YouTube channel). Become a buddy: If after you’ve participated you’d like to join our team and help organize future events, become a “buddy” by joining us here. We’ll add you to our Slack team which we use for this purpose. Are you physically at the conference? If you are attending the conference and wondering what’s for me, stop by. We would love to see you. You don’t have to appear on camera. Come by, listen to the conversation, take pictures, and tweet about the experience (don’t forget to tag us @VConnecting and use the conference hashtag #ASCILITE17). Please note that even though we have events scheduled ahead of time, sometimes we start a little earlier than planned for various reasons; while we plan to spend around 30 minutes with those onsite, sometimes they may have to leave earlier, and sometimes they may be willing to stay longer. We embrace imperfection and spontaneity and we hope you will too, understanding the nature of hybrid connections. Virtually Connecting from #ELI 2018 on January 30, 2018. Thank you, I am in, can you please add!